Jay Nava, a soldier, was being investigated by the police for sexual assault. Natasha Wake had not known about the allegation (for which Nava was not charged) prior to the evening of her murder. The Telegraph coverage implies that the "bitter and acrimonious" argument that evening resulted in murder - as though being angry at being lied to is unreasonable behaviour in a woman. The other common excuse for male violence is "love". It doesn't matter how many times a man claims to love a woman - domestic violence and femicide are not acts of love. They are the acts of violent and controlling men who view women as possessions. 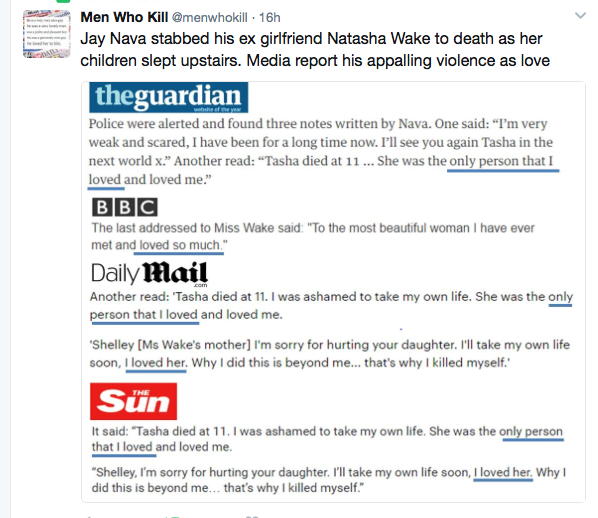 The media needs to stop reporting this use of the word love as an excuse for male violence as it perpetuates the context in which male violence occurs. Natasha Wake did not deserve to die. No man should be able to use the word love to minimise their criminal acts.